Last chance to grab a bargain in the Sevenoaks sale | What Hi-Fi? Time is running out to grab a bargain. 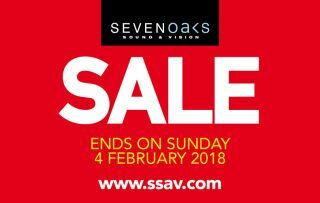 The Sevenoaks sale, which includes fantastic offers on TVs, hi-fi and AV gear, ends on February 4. Whether you’re after a new 4K receiver, bookshelf speakers or a UHD TV, there’s many a bargain to be had. Don’t miss out! There are lots of products still available, please click here to see all offers.